The progressive neurodegenerative disorder Huntington’s disease (HD) results from the expansion of CAG triplets in the huntingtin gene. HD symptoms appear later in life, and it is possible that endogenous neuroprotective mechanisms delay disease progression. Aberrant signaling in endoplasmic reticulum (ER) stress pathways is implicated in HD pathogenesis; therefore, compensatory changes that normalize ER stress signaling may confer early neuroprotection. José Naranjo and colleagues at the Centro Nacional de Biotecnologia-CSIC determined that downregulation of the multifunctional calcium binding protein DREAM (downstream regulator element antagonist modulator) is a compensatory neuroprotective mechanism in HD. In HD mouse models (R6/1 and R6/2), DREAM expression was reduced in the striatum and other brain regions, an effect that could be observed prior to or at the commencement of disease symptoms. DREAM haplodeficiency delayed the onset of HD motor symptoms and increased longevity in R6/2 mice compared to controls, and long-term administration of repaglinide, a small molecule DREAM inhibitor, reduced motor deficits and striatal atrophy in R6/2 mice. Using an HD model striatal cell line, the authors demonstrated that DREAM binds the ER stress sensor ATF6, an interaction that was partially blocked by repaglinide. Nuclear ATF6 protein levels and ATF6-dependent transcriptional activity were reduced in HD mice compared to controls, and these deficits were rescued by chronic repaglinide administration. Together, these results suggest that derepression of ATF6-dependent transcription, through DREAM downregulation or pharmacological inhibition, may be neuroprotective in HD. The accompanying image shows ATF6 expression (brown) in striatal neurons from WT (left panels) and R6/2 (right panels) mice. Following vehicle or repaglinide treatment, WT neurons display diffuse intracellular ATF6 expression, whereas dense aggregates are observed in R6/2 mice (top right). 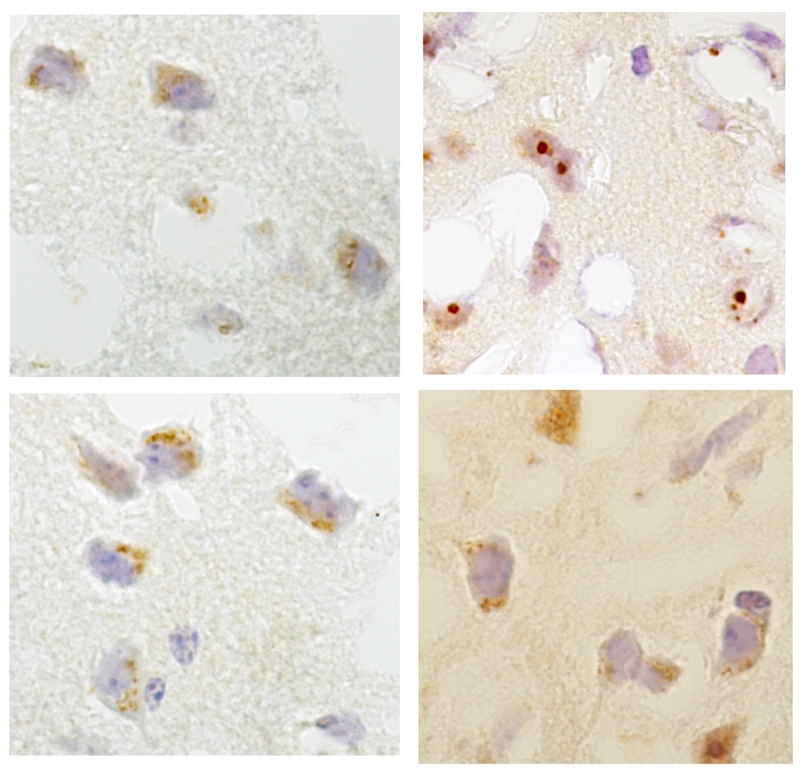 Diffuse ATF6 labeling is restored in R6/2 mice following chronic repaglinide treatment (bottom left). Citation Information: J Clin Invest. 2016;126(2):627-638. https://doi.org/10.1172/JCI82670. Deregulated protein and Ca2+ homeostasis underlie synaptic dysfunction and neurodegeneration in Huntington disease (HD); however, the factors that disrupt homeostasis are not fully understood. Here, we determined that expression of downstream regulatory element antagonist modulator (DREAM), a multifunctional Ca2+-binding protein, is reduced in murine in vivo and in vitro HD models and in HD patients. DREAM downregulation was observed early after birth and was associated with endogenous neuroprotection. In the R6/2 mouse HD model, induced DREAM haplodeficiency or blockade of DREAM activity by chronic administration of the drug repaglinide delayed onset of motor dysfunction, reduced striatal atrophy, and prolonged life span. DREAM-related neuroprotection was linked to an interaction between DREAM and the unfolded protein response (UPR) sensor activating transcription factor 6 (ATF6). Repaglinide blocked this interaction and enhanced ATF6 processing and nuclear accumulation of transcriptionally active ATF6, improving prosurvival UPR function in striatal neurons. Together, our results identify a role for DREAM silencing in the activation of ATF6 signaling, which promotes early neuroprotection in HD.